Happy New Year! I sincerely hope that everyone enjoyed a relaxing summer. The beginning of the school year is always an exciting and energizing time that continues to remind me how blessed I am to work in the field of education. I know our talented staff will return on Monday, August 22nd, refreshed and full of enthusiasm for the upcoming year. The following week, August 29th, our wonderful children will bring their own energy and eagerness to connect with their friends and engage in their learning. Quite simply, this is a wonderful time of year! 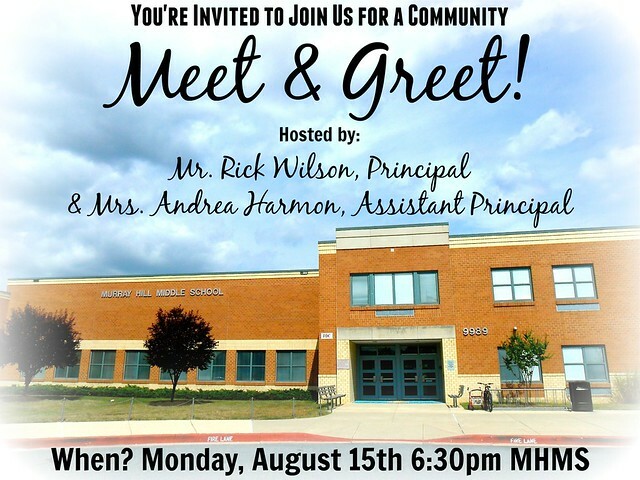 Since this is my first year at Murray Hill, I would like to provide you with the opportunity to meet me, Mrs. Harmon, talented Assistant Principal, and your new PTA Executive Board in a very informal fashion before this school year begins. Please mark your calendars for Monday, August 15th at 6:30 pmi n the Murray Hill cafeteria for this “Meet and Greet” session. The success of our students is a team effort and we look forward to working closely with you this school year to make this a successful, inspiring and engaging one for all!